If you're Valentine gets off on nuts, these Triple Chocolate Almonds from Cali chocolate veteran Charles Chocolates will go over quite well. 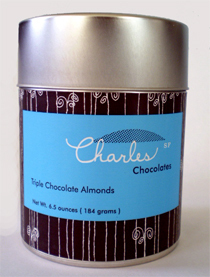 Charles coats premium roasted almonds in an amazing mixture of 65% bittersweet and 41% milk chocolates, then dusts them in cocoa powder. The result is a really delicious marriage of flavor. Not to mention the eye-catching tin. Man...I just eat almonds straight. I also take almond butter by the spoonful. I'm vegetarian, so that's probably a deficiency craving. Cocoa + Valentine's Day Specials on Cartoon Network + your dude = Nirvana. At least until you get into a fuss over the remote. 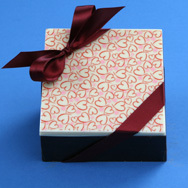 chocolate covered almonds are my weakness...and i couldn't imagine getting an edible box...holy crap, I'd be in heaven!